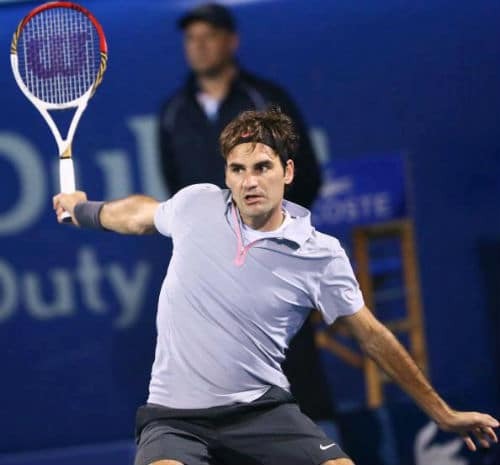 Hey all, what a stellar performance from Federer tonight as he completely outplayed Nikolay Davydenko to move seamlessly into the Dubai Semi Finals. I thought Roger would win but might be in for a tough ride tonight; yet as it turned out this was a complete clinic from the GOAT who gave Davydenko a tennis lesson out there tonight with imperious serving and brutal groundstrokes from start to finish. After looking sluggish against Jaziri and improving considerably against Granollers, Roger stepped it up again tonight making 76% of his first serves, converting 4 of 7 break points and not dropping his own serve en route to a 6-2 6-2 victory. GOAT display. Davydenko is the sort of player that can start hitting the ball stupidly well from the very first point but it was Roger who came out with a bang in tonight’s match, setting up 2 break point chances in the very first game which were wasted, holding to love himself and then breaking at the second time of asking to take a 3-1 lead. Another break followed with more clean ball striking from the Wilson Wand and with a 4-1 lead the set was practically in the hands of the Swiss. It’s tough to say what Davydenko could have done differently, he was hitting the ball well but Roger was able to boss all the points, the Russian did miss a few makeable volleys but he was always under pressure. At 5-2 Roger made a sweet half volley pick up on his way to 40-0 and 3 set points, he got pegged back to deuce but reeled off 2 more points to seal the first set in just 29 minutes. The second set was almost an action replay of the first and Roger was now in the ascendency breaking again at 1-1 and soon found himself leading 3-1. 3-1 soon became 4-1 after Roger broke serve yet again and then held to love before serving out the the match in style 6-2 6-2. Well peRFect display as far as I’m concerned, perhaps Davydenko is a tailor made opponent who’s passed his best but you still have to get the job done. The Russian is still more than capable of winning matches again top guys having beaten Tipsarevic in the first round but Roger just never allowed him to settle. It was easily Roger’s best match of the week so far and everything clicked. When he is able to fire down the first serve and back it up with a big forehand then the Fed express turns into an unstoppable freight train. In terms of the match stats they make great reading with 5 aces, 0 double faults, 76% of first serves in play, and incredibly winning 70% of the points behind his second serve despite playing an aggressive returner. Also rather surprisingly the break point conversion rate of over almost 60% (4 from 7) was impressive. Davydenko isn’t at the peak of his powers anymore and clowned up a few volleys to hand over cheap points but more often than not it was Roger stepping into the court and hitting some of the sweetest times forehands you’ll ever see. As predicted it’s Federer vs. Berdych in the Semi Final and it’s the first time these 2 have met since Berdych beat Federer in 4 sets at the US Open. That was a painful loss for both Roger and the fans at the time so I’m hoping he takes the form he showed today into that match and teaches Berdshit a tennis lesson. It won’t be easy I don’t think as Berdych played well in Marseille and has looked good this week in most of his matches but I think Roger can take this one if he plays smart, aggressive tennis much like he did today. Berdych has a habit of zoning in against Federer but the fact still remains he is a mentally weak player as we saw against Tsonga in Marseille and also briefly against Tobias Kamke earlier in the week where he was broken twice and faced an awful lot of break points. I watched the Marseille final and Berdych lost against Tsonga because he completely lost the plot mentally, questioning the umpire and moaning about minor things like Tsonga jumping up and down on the return, it caused him to boil over and that threw his game out of synch. I think Roger has to be aware of that and use it to his advantage, if he can dominant all the plays and get under Berdych’s skin at the same time by either playing unreal tennis or even taking a leaf out of Tsonga’s book and jumping around on the return he'd win the match I just know it. I don’t think Roger will use that kind of tactic but I’d sure like to see him to do it, remember when he psyched Nadal out in the Madrid 2009 final? Boom! Tactics aside, I think the faster courts here will favour Roger too, and if he can serve well then I reckon the break point chances will come and he’ll take them when it counts. It could go 3 but I think Fed might get this one done in straight sets 7-5 6-4 and in all likelihood will face Djokovic in the final (he plays Del Potro so that might be fun) I’ll be back with a report tomorrow of hopefully an emphatic Federer win. Allez les Suisse! Played well today, serve was well on form! Hope he gives Berdshit a beat down. Hey… I recieved ur email for this post. Cheers. I didnt see the match so ill b off to youtube for the highlights after this. Looks like Fed was playing some good tennis. I hope he does the same against Bedshit and destroys him. I think Potro might give the Djoker a run for his money?? There might b a upset on the cards, come on Potro and most of all COME ON ROGER!! Not sure about delpo… He’s going on about a wrist injury, and with the way djoker disposed of seppi, I only one winner, and a pretty easy one as well… Hope not, but I’m not too optimistic about delpo. Yeah Del Potro is unpredictable. Although he can play well against Djoker, did ok at US Open despite losing in straights. He has to really tee off I think, if it goes 3 then he is toast. If memory serves me right, Delpo was a set and break up against Djoker in WTF 2012 semi final from where he went on to lose the match. So this should (in fact both the semis) be an interesting one. COME ON FED! Yeah his fitness was a joke in that match at the WTF, 3rd set he could hardly move! Best match of the tournament so far from Fed. Although guess that wasn’t difficult. Made Kolya look average. 19-2 H2H. Crazy. And I think that is the truth. Davy has become average. Has lost zip, speed and consistency, and simply does not hv a B game, and his volley is the worst I hv ev seen. Prob made Fed look better than he was, looked like a practise session at times! Berdych much bigger test. All about Fed holding on to his serve and taking advantage of the 1/2 break points he may get. Being wasteful just won’t cut it! Hoping the heat, flying balls, and court speed will favour Fed but still see a v tight match. Hoping Delpo can upset Novak. He is certainly up for it, and on a roll of confidence, and given Novak has, as usual, played complete journeymen so far, may just play into Delpos hands. My prediction, Fed 7-5,7-6. Delpo 6-4, 7-6( may even go to 3 sets). Anyway, lots of tiebreaks! Yeah Denko isn’t what he was. But he can still give some players a headache I think. Just hope Roger shows JesusFed form vs Berdych. Has to be done. Allez! Haha guys! Now what, a competition to be the first commentator, is it? A fantastic match and win, indeed a GOAT performance in every department, particularly impressed by his clean ball strikes both FH and BH with such a beautiful movement. I really enjoyed it, though felt almost bad for Nikolay… Hope Roger plays like he did against Berdych in Paris Master 2011 tomorrow. Allez! Btw, Jonathan, I noticed that Point of the Match Video was PeRFect Tennis original production? It looks that way, are you going to compete?? Yeah he turned it up a notch today, good to see. Especially considering some of his “fans” were writing him off after the Benneteau loss then dropping a set to Jaziri. I’m gonna be mega annoyed if he don’t beat Berdych tomrorow. It’s personal! Fed-Djoker final will be great. For me it would be 5 bottles of wine till numbing the pain, then 5kg of chocolate till my face gets all spotty and ugly. Which is NOT going to happen, all right, Roger? Allez! Ah lucky you! Looks like there is a good atmosphere in the night matches. Hoping Fed turns up the heat tonight. Has to make the final and get 2013 started. @Wanda Haha he simply has to win. No doubts about it. Look at him, all high and mighty 😉 thinks he’s won already! Oh yeah Sid, wanna piece of me? I’m so in! Bring on Berdych! Time for revenge! I have not seen one person who actually likes Berdcrap. :-C i hope for his sake that Berdshit losses or alot of people including myself will be angry and i might have to join Sid at the gym to let off steam. I was thinking of starting at the punchbag. A solid punching workout of 2mins should do the trick!! I can then tell people iv done a full 2 hour workout and go home for a nice hot curry. Sorted, come on Fed dont let me down !!!! I don’t like who Roger doesn’t like. Roger doesn’t like Turdych. Hence, I do not like Turdych. @Sid – exactly, you can tell Fed isn’t a Berdych fan. So neither am I. He brings nothing to the tour. Good player on his day though, just an arse. Loved it when Almagro hit the ball at him. Also, remember Gonzalez deliberately hitting a smash into Stepanek? A well deserved on actually. Well, Davy didn’t know what to do anymore at some point… 😉 He said this afterwards: “He was impressive w/serve.His ball was like a bullet, he played unreal, i had no chance”… Says a lot I think. There was FedMagic on court. Loved it! Now Berdy’s on and I hope with more than all my heart, like many of us, Fed will fly, play unreal again, so he wins and Berdy can have a long hard think about this match. Berdy’s weakness is on the mental side I think. A lot of things ‘get to him’. Here in Dubai too. And what I really hope that if we see Fed even better than yesterday, that’s going to get to him and breaks him down… He needs a good kick… I think Fed can win this, probably in 3 and there is nothing more that I hope will happen today than this… Allez!! Ah I didn’t see the interview with Davydenko. Nice comments from him, he’s normally talking rubbish but praised Fed which is good. I hope Fed fly’s too! Allez. Like you said, Berdych is mentally weak and as I said above Roger has to psych him out and let Berdych’s mind play tricks on him. Then he can dominate. Allez Roger! I just had two scoops of rich chocolate whey. I suspect I might need a few more soon. Hey Sid … I know exactly what u r saying, but u forgot to mention *******&##########%%%%@@@@@@%%%%%%!!!!!!!!!!!!! !&&&&&&&¥¥¥¥¥¥¥¡¡§§§§§§§^^^^ why people hate Berdcrap. Yup, Djoker will win easily I think. Fed screwed this one up, wasted his chance. I hate tennis. I really hate tennis. Me too! Was on Feds racquet in that TB though!!! He will be furious with himself! Shld hv come in more, cannot deal with the flat power! Played a couple of casual shots and all over! Thin but key margins! Vvv annoying! Think it is going to be a frustrating yr for Fed! And his fans! Serving first in 3rd set as well! As J said, he needs a tournament win!!!!! That’s what I fear too, Susie. 2013 may not be a good year for Roger. I’ve kept myself mentally prepared. Yeah he had the match in his hands. Plenty of regrets from this one I think. See what happens, maybe he performs later on towards the US Open. Can’t see clay going to well. Folks, I’m feeling really sick today. I think it’s Berd Flu. Me, too, Sid. It’s gonna be a epidemic. Hi Wanda u took the words right out of my unwell sick mouth!!! Same here, still not over this one! I think i maybe suffering from the same symtoms. Theres a epidemic goin around today. I dont know what to take to make me feel better. Oh well!! I need to recover for Indian Wells. I dunno, it’s Slowami so he could get owned there. Not exactly a happy hunting ground for him. He needs a win though that’s for sure. Needs to focus mentally and play clutch against the top guys. I took 8 ounces of the last set from the Madrid “Blue” Clay 2012 final. Berdshit and Fed hate each other. Berdman aint scared of Fed though, almost like he knows he owns him. Frustrating. I’m still annoyed with this one though. Most losses are forgiveable but this was poor. Hi guys, anybody but birdshit, I agree. I haven’t seen the match yet, will see it in a couple of hours, but really a bummer now that I know fed loses. The only match that I would be for the joker will be against Berdshitt. Anyway, I wanted to say something about the fed-davydenko match. I don’t agree that davyd was destroyed. I saw the highlights, and he was missing a bit more than fed, but he hit some amazing winners like fed did. I still think that he’s still top 10 material. I don’t think he’s lost much, I just think that when you have kids and a family, the concentration goes a bit. He hits the ball early and on the rise as good as anyone except maybe fed. I don’t think that he gets the credit he deserves. I think that he went as high as 2 in the world. You don’t get there being chopped liver. Here’s a question for you, and others Jonathan: Why does Berdshit always bring his A game against Fed? He even beat fed when Berdshit first came out on tour at the olympics. Maybe fed needs to give him more off pace crap. He probably feeds off of feds pace. I’m not sure, but I’ll be thinking about it tonight when I watch the match. Oh well….. back to the drawing board. Is his vacation starting now? Or after the next tourney? Tim, it’s not about bringing the A game. It’s just a style issue. Big, side arm type of serve. See ball hit mentality. Add to that Roger’s inability to make decent returns with his equipment. And, Turdych zeroing in on his second serve. It’s what it is and it is only going to get tougher. Despite all that, Roger had at least one match point on his own serve (three in total I read). I didn’t watch the first two sets (only the third after a friend texted me it was going the distance). So, just one of those days. Hi Tim… Regading Davy match u r right there were errors but he made up for it at vital moments with great FH and BHs. Your question about Berdpoo about why he has his A game with Fed is a good one. Against other players a little twitch gets him all flustered under the coller and loses his rag and therefore loses. But no with Fed he has to play like superman with a FH like Lendls. Its just one of thoughs things!?! This loss is a hurtfull one cos all Fed fans know if he just could of taken one of breakpoints, it would of been a different story. Like u said Tim what a bummer!!! Yeah Berdych always zones in against Federer that’s for sure. It’s like he is his nemesis. Big match up issue too, awkward opponent and he hits such a heavy ball. Main area he kills Fed is when he hits inside out forehand onto Fed’s backhand that he has to defensively slice. Really struggles to get back into those points once he’s on the defensive. I just watched whole match. Fed should have won it in the second set. Some bad mental errors like missing a shoulder high forehand slicing it 6″ long from the baseline. Really frustrating. No excuses should have won this one. Berdshit was lucky. Physically fed was there , mentally not. I agree Sid a 95 or 100 sq.” racquet may help on service returns. You think switching racket head size would help? and if it does, do you really think he would do it?… what is his racket head size now? I have a feeling this going to be a 2010 like year… I’ve got to admit I’m not very hopeful right now…. Yeah he mentally went away after wasting the match points. The backhand slice error was poor on his match point, it was a nothing shot and he went long with it, criminal. I dunno about changing equipment, could be a rash decision. Wasn’t like he was shanking a lot. Just the return of serve wasn’t great but I think that’s maybe down to confidence or lack of. Kept retreating behind the baseline and not really going for it. Tough to play it right every time though, if he goes for a ripper and frames it then “oh he should have sliced” and then if he slices and leaves an easy put away “oh he should go more aggressive”. Difficult one. Annoying loss is an understatement. Roger 3.0 not appearing when needed. I’m very angry because I only just saw the match and didn’t know the outcome before I watched it which was a bit stupid but I thought Davydenko match was telling in Federer’s form and I really believed he was beating Novak in the final. Some things are not meant to be. What hurts the most is that Berdych will go on and get crushed by Novak. This is pretty much one of the only courts left on tour that Federer can beat Djokovic convincingly, so much for that. Indian Wells not looking too good now I guess, this match is going to be painful for Fed for a few days but he needs to focus on making a semi run at Indian Wells at the least and now with him loosing more points, Murray has an even bigger chance to take the number two ranking by the end of next week if he wins. Oh Roger…Need to hear Jonathan’s thoughts on this match asap! He always puts his losses in perspective but even looking at his twitter I don’t think even he believes Roger is motivated to make an extra push. Yeah Fed. 3.0 was AWOL after wasting MP. When he served the ace at 5-4 I was sure he’d do it but just didn’t happen. And you’re right, I think Berdych will get destroyed. Not overly confident for IW but just gotta see what happens. I’ve done my post. Not sure what to think about Fed. Looks unmotivated but who knows. Good points man. You’re right he was on a mental walkabout. And then once the MP had gone he was out of it. Looked mega annoyed and no real idea on what to do. Can’t see him moving up a racket size. Would probably help though. Needs to win a tough match to get his mojo back.